Blog-post from Esther Tot, who received the ESOMAR Foundation Scholarship to study at the English based Bachelor Degree program in International Business at the National University of Management (NUM) in Phnom Penh, Cambodia. What is like to be a college junior? School was great, although, the third year was tough and quite stressful with a lot of assignments, projects, presentations, panda-eyes and sleepless nights. However, no matter how hard it is, knowledge and education is a must, and just like a quote I keep telling myself, “I may not be the smartest person in the class, but I will surely do the best to succeed and graduate just like others”. Each year is exciting and interesting because I’ve got to study with many different teachers who are from diverse cultures and countries. It is so interesting that I can learn more about other countries and cultures through them even though I can’t go there directly. But in NUM they bring the countries and cultures to students and most of the time NUM also brings students there directly as well, which is so cool! This is my third year and semester 1. I have an important 2 weeks’ straight session with Professor Anselm Vermeulen. He is from Holland, but currently lives in China and teaches in one of China’s most famous universities. I studied with him Operation Management. We have a research essay about Industry 4.0, 5.0, RFID and Barcode, and lastly, I have done a presentation about the Xiaomi company (Chinese technologies manufacturing company). 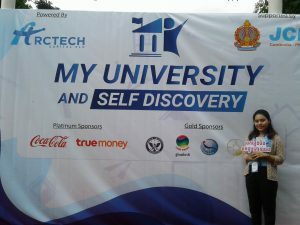 On Tuesday I have Human Resource Management class with Mrs. Ros Chan Sophea. She is our Cambodian teacher. I have learned a lot about how to choose the right person for a job in the future. By learning about HRM I can prepare myself well for a job in the future as well. On Wednesday I have Mr. Nikhil Mani. He is Indian, but he graduated in Europe. I study with him about Public Relations and learn quite a lot about PR tools, and how PR teams handle company scandals, and how PR operates in companies. PR is one of the important teams in a company as well as the marketing team. On Thursday I have Ms. Mitsy Chanel-Blot. She is African-American. I study with her about Globalization II, which include histories, cultures, foods, religions, and people. She is also one of the funniest teachers we have this semester, and we really have fun studying with her because she makes learning fun. She is open-minded and a supportive teacher. And lastly Friday, I have Ms. Kerry Slattery. She teaches Marketing Management. We have been assigned a great project of making a proposal for Total Gas Station based on steering more men and adults to choose and trust in their gas stations and be their loyal customers. Only 3 teams were selected by Total and sadly my team was not among them. My team had a proposal about Jet-Ski Racing which has not yet been introduced in Cambodia. We wanted to bring that here, but we haven’t been selected, I hope maybe next time they will take our idea into consideration someday because Cambodian people and men here love sports so much. Nonetheless, half of the students at my University now are on their joyful vacation, but my class hasn’t finished yet, we still got so much to go and maybe we will have a short break next month on March, which is also my birthday. On March 1st I will be 21 years old, I’m getting older! I will always be so much thankful for the precious gift of knowledge and education from the ESOMAR Foundation, WiRE and NUM and for giving me this special opportunity to be able to study at the university and graduate like other kids. This is more than what I could thank for. I am excited for the next journey to come, waiting for what I will be learning next in the second semester, can’t wait for that, especially to meet new teachers, and learn new knowledge about the courses and about diversifications through them as well, which is so interesting to me. I am looking forward to updating more about me during the short break and as well as back to school for the second semester.